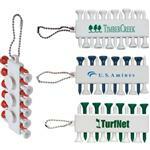 Custom golf tees - a great golf promotional item! Biodegradable golf tees with your personalized logo. 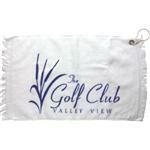 Great for golf tournaments. RUSH AVAILABLE! Production Times Available: 5-7 Business Days. Rush production available - please inquire. Available Imprint Options: 1 color imprint only. Biodegradable wood golf tees custom imprinted with your promotional logo. 0.3 pounds per 100 pieces.